Russia’s design bureau NPO Energomash is to deliver 60 RD 181 engines for the Antares rocket first stage to American space technology manufacturer Orbital Sciences Corporation. The total cost of the deal is about $1 billion. According to Solntsev, Russia’s government has already issued all the permits required for the deal. The contract envisages restrictions for the use of RD-181 engines in military programs as those rockets cannot be used for military goals. Following an engine failure and subsequent explosion during the Antares launch in October, the company halted all launches, struggling to find a replacement. The reliability of the RD-181 and similar engines made it the best choice, Orbital’s vice president for space launch strategic development, Mark Pieczynski, told Aviation Week in December. The engine was developed specially for Antares and it allows more cargo to be delivered to the International Space Station and to low orbits. Using new technologies and materials the engineers managed to increase the motive power to 186 tons. The total cost of the deal is estimated at $1 billion. This sum includes not only the price of the engines but a set of services as well. Energomash will provide flight preparation, training, engines installation and its test operations. According to Solntsev, the US would have to spend about $3 billion to develop its own engine for Antares and the process would take up to 10 years, without guarantee of success. That’s why Energomash plans to cooperate with Orbital Sciences Corporation for 15-20 years. “I believe the contract is focused on cooperation over 15-25 years, as no one will regularly change engines on a rocket,” he said. Energomash is Russia’s leading rocket engines producer. The company has cooperated with the Orbital Sciences Corporation since 1990, delivering RD 180 engines for Atlas rockets. Later, the AJ-26 engines, based on the Soviet NK 33, were used for Antares. 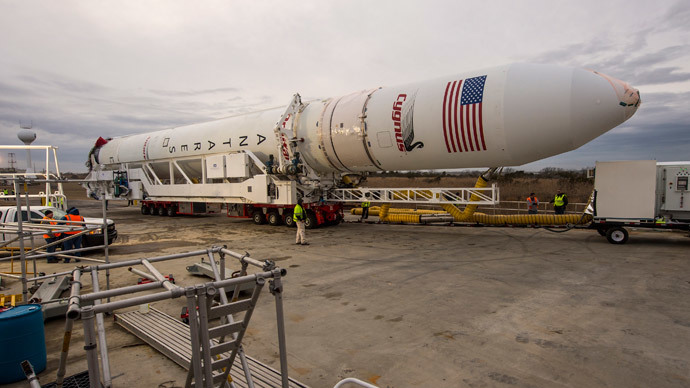 The Antares rockets are also used to launch Cygnus, OSC’s new automated cargo spacecraft, which is part of NASA's Commercial Orbital Transportation Services program. Last April, the US halted cooperation with Russia in other spaсe programs apart from the International Space Station program. However, the sanctions do not apply to Energomash. Long-term cooperation in other programs is still under discussion, however.